Some believe that falconers will starve a hawk to get the bird to work with them. How else can one explain why a wild hawk would be so willing to work with a human? However this belief could not be further from the truth! Weight management is a broad term that covers various methods and equipment that is used to manage the birds condition. The term condition in falconry is most often used to describe a birds physical state and readiness to hunt. 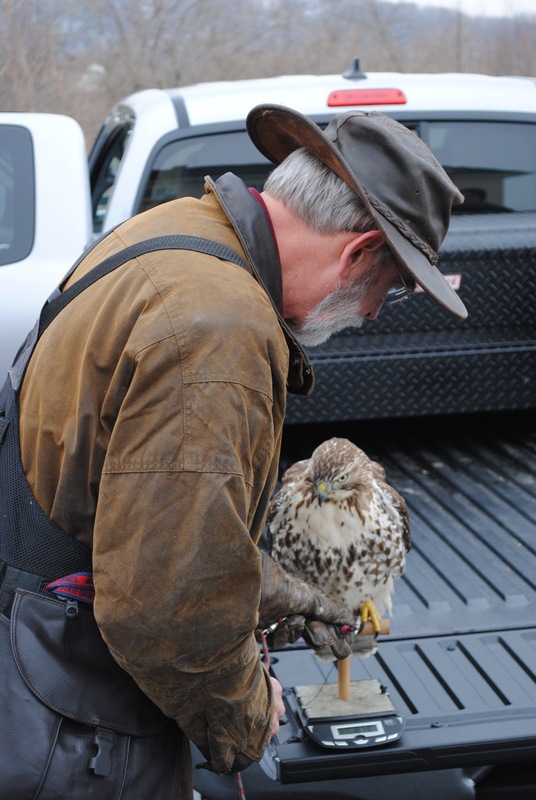 Keeping a hawk in good health is a falconers top priority. Weight management will not only tell when the hawk is ready to hunt but more importantly alert the falconer if the hawk becomes ill. For example, a Kestrel weighs as little as four ounces and has a very fast metabolism; with little to no fat reserve the difference between an unhealthy and healthy Kestrel could be less than one ounce. Immediately after a hawk is trapped the falconer weighs the bird. This is referred to as “trap weight” and serves as the baseline for the hawk. It is also a common opinion that the “24hr weight” is a more accurate disclosure of a birds baseline weight. Birds come into possession in all sorts of variances of condition; from a full belly and crop to completely empty. Falconers take weight management very seriously. In fact, falconers usually weigh their birds daily, sometimes several times a day depending on the species. A hawk that is underweight will not have the energy to hunt, a hawk that is overweight will have no reason to hunt. One could make the case that weight management is the most important aspect of falconry. Weight management is also important for training and conditioning a hawk. The fact is, hawks come in all shapes and sizes and there is no such thing as one size fits all. Managing weight is more in-depth than one may think. Things like weather, what a hawk ate or how long they hunted will affect how much they weigh from day to day. Most falconers keep a journal of their birds weights along with the variables to maintain a happy, healthy hawk all season.